After I discussed the Gucci material, we continue with the most important part of authenticating Gucci purses. A fair warning before you start reading: the 3 following sections have LOTS of photos. And when I mean lots, I mean loaded by 50 plus images (just counting those images I combined as one). But with your quest in knowing how to tell if a Gucci bag is real, you need to train your eyes very well. This is where we begin the Gucci bag serial number check. As mentioned in my previous post, this is where I easily weed out fake bags from the real one. Whenever I was asked to sell something, or was in secondhand stores to score a find, I open the bag straight away and look for the leather tag and serial. The letter ‘G’: the letter G is very round. If you extend the curve line from the top-right and bottom-right you will form almost a perfect circle. But this is a G (not an O), and you can see that the top-right of the G has a flat side, then almost curving below like a comma. The top of the letter is thin, that gradually thickens as the stroke moves to the left. Lastly, the G has a serif on both sides. The serifs have the same size; unlike the longer-in, shorter-out of the GG monogram print. The letter ‘U’: the letter U starts with a thin right stroke that gradually thickens to the left stroke. This is important because a lot of fakes have the same right-and-left legs. The tops are also both topped with equally-sized serifs. The letter ‘C’: Gucci, obviously, has two Cs. Starting with the top-right stroke, it is thicker going into the top-most thin part of the letter. This also gradually thickens to the left part, that gradually thins again to the bottom part. Now, you will notice the two right sides are flat if you run an imaginary line next to it. The letter ‘I’: the letter ‘I’ looks straightforward. However, please note that both the top and bottom parts of the letter have equally-sized serifs on them. That pretty much sums up the Gucci logo font. However, as we go along, you will see that this Gucci font on the bag, and any marking on the leather tag for that matter, is not created equal. Time and again, people claim that the lines should be like this, or the embossing/lettering should be clear all throughout etc. From my experience of handling hundreds of Gucci bags, this is not always the case. Why? Let us call a spade a spade: while Gucci is one of the most sought-after and highly desirable brand in the world, it is no Hermès. If you are looking at PERFECTION in all details to ascertain a big is authentic, then you will be sorry to hear this. A lot of authentic Gucci bags will be deemed fake if we apply these one-size, fits-all tips. The manner by which Gucci bags are made vary. Whether from flagship stores or outlets, vintage or new ones, there will be slight inconsistencies with the products even with a stringent quality check. The point is, you should not rely alone in a single determinant to authenticate a Gucci bag. Personally, I look at the leather tag and serial number 80% of the time, taking into consideration some production inconsistencies, and then look at the other details. So, do all vintage Gucci bags have a serial number? Well, yes and no. For instance, very early handbags by Gucci had model numbers, but things changed around 1960s as some handbags had while the other did not have a model number. (For an in depth analysis with visual reference, especially bags from the 1930s until 1990s onwards, you may check the Evolution of the GUCCI Trademark page). By the 1970s, vintage Gucci bags only had the Gucci script (cursive) with no serial or model numbers. However, the vintage Gucci Accessory Collection bags released from 1979 to 1983 had the serial number in gold. You see items available online with some of the gold lettering faded or peeling off. While there is a dedicated section for vintage Gucci Accessory Collection (GAC), we will be discussing serial numbers of vintage Gucci bags here as a whole. Not all vintage bags fall under the GAC line, anyway. Below is an example of a vintage GAC leather tag. Notice that it is rectangular, rounded on the edges, and usually attached in the lining below the inside zipped pocket. It has the Gucci knight crest on top, with the words “GUCCI” (all caps), “Accessory Collection” (cursive) and “MADE IN ITALY” (all caps) embossed in gold lettering. Take a look at the font of GUCCI, which fits perfectly in the anatomy we discussed above. Vintage Gucci Accessory Collection bag with serial number 001-4071-5.. However, this front leather tag lettering isn’t always the very clean — but it doesn’t mean it’s fake. As you can see from the ‘T’ in ITALY above, the horizontal line is slightly lopsided. This is one of the inconsistencies I have mentioned earlier on. Take a look at the serial number above and below. The numbers are all embossed in gold as well. They are usually grouped in three, divided by either a dash or a dot. If you look at the number ‘1’ in ’10’ below, you will notice that it looks a bit small with the rest of the group. This should not be an adequate cause of concern. It is still an authentic vintage Gucci accessory collection bag. There is also a serif on the number ‘1’, and if you look at number ‘2’, there is a small dot on top where the stroke starts. The number ‘7’ starts of thick and tapers on the top stroke, with the same width on the down stroke. The ‘0’ is not circular but oval. Through time, the gold lettering might fade. This will only leave the embossing of Gucci knight crest, letters and numbers on the leather. If you also look closely, some authentic GAC bags even have a registered trademark (®) after GUCCI. As mentioned, not all vintage bags fall under the GAC. An example of this is the a vintage Gucci box bag, with the leather tag and serial number below. Just like GAC, this leather tag is affixed below the inside zipper. It is round and has a gold-tone hardware affixed to it. If you look closely, you see the Gucci knight crest, the correct Gucci font, the registered trademark (®), and the MADE IN ITALY engraved on it. As there is a metal hardware, this is concealed by another piece of leather where the serial number is embossed. In some cases, due to the age of the bag, the two leather pieces are split showing how the gold plaque is attached. In the next post, I will discuss another style of leather tags. This looks slightly similar to the last two examples above, with modifications. How can i cind out how much my purse is worth? Hi, you can bring your Gucci bag to an appraiser such as a bag consignor. Cheers! I would like you opinion on a very old Gucci bag… How can I post pictures? Hi Teri! Please upload a clear and close-up photos of the Gucci bag on Tinypic or Imgur, and paste the links here. Cheers! hello, how can i find out if my Gucci purse is real or fake? Hi please put the link in your reply. Bagaholic101, how do I post a new question I have about a vintage Gucci micro gg shoulder flap? Hi Alison! For this free Gucci bag authentication, I will be needing clear photos of the Gucci bag, especially the Gucci tag and serial number. Please upload on Imgur or Tinypic, and put the links in your comment. Cheers! I just bought a vintage Gucci purse, however I tried looking for other bags, with the same serial number and found now. Does this mean the pride us a fake? The serial number is,22-0014793. Hi! It is not unheard of not to find an exact Gucci bag with the same serial number. Please post photos of the bag so we can have a good look. Cheers! Hi! Please put the link here. Thanks! Can you please check these out and ket me know your thoughts? Thanks so much! Hi LM! This Gucci Marmont bag with serial number “431384 1978” is fake, unfortunately. Cheers! Hi, could you please tell me if this marmont mini is authentic please? Thank you! Hi NC! This Gucci Marmont Bag with serial number “446744 498879” is authentic. Cheers! Hi Joumana! You may try BAGAHOLIC 101’s Gucci bag authentication service for only a minimal fee of US$ 5. More information here: https://bagaholic101.com/gucci-authentication-service-by-bagaholic-101/ . Cheers! HI. I bought this bag off of eBay usually I’m pretty good at spotting a bag that is not real but this one was difficult can you please help me our and let me know if this bag is authentic I would appreciate it so much here are some detailed photos well I have photos but how can I post them on here to show you ? I want to purchase a bag online and I’m not sure if it’s authentic. Could I email you the photos and you could tell me what you think? Please get back to me. Thanks so much. Hi! Please post a link of the photos of your bag. You may upload it on Photobucket or Tinypic. Cheers! 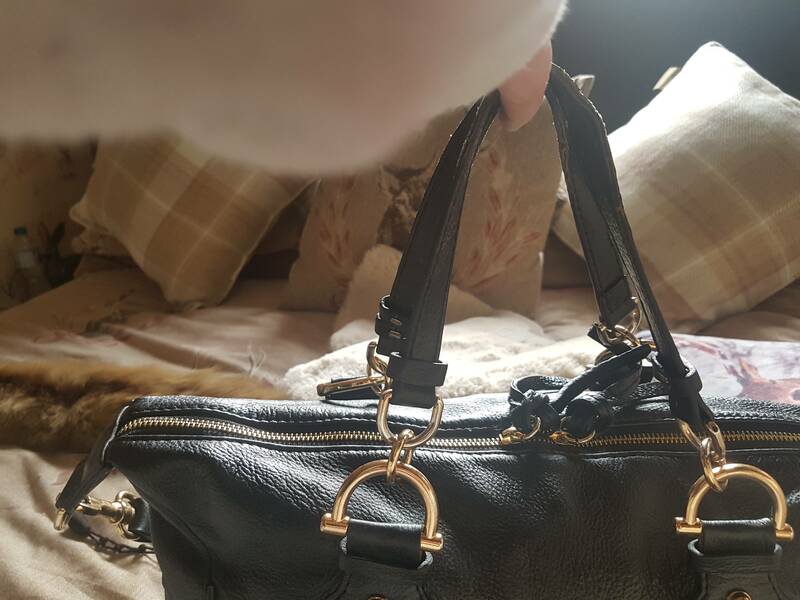 I need your help I have my bag and havent been able to find the model or to find if is authentic…. Hi! Please look underneath the rectangular tag inside the bag. Cheers! Do all vintage Gucci fanny pack bags have a serial number? The bag I purchased looks authentic but there is no leather tag inside and no serial number to be found. Hi M. Koffmeier! 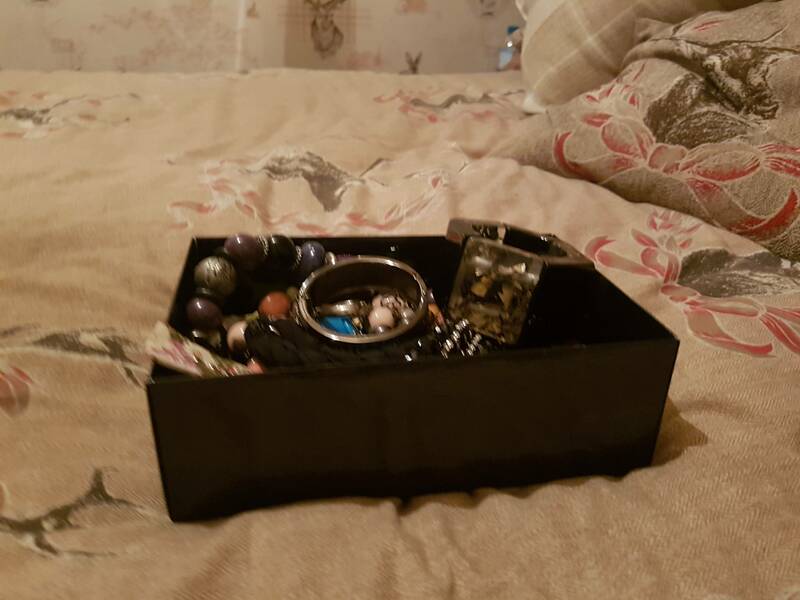 You may post a link to your photos so I can have a look. Upload it on Photobucket or any image hosting site. Cheers! I would absolutely love your guidance! I am looking at this beautiful bag on Poshmark. The price is very low but I want to believe! Hi Michelle! Yes, this is an authentic vintage Gucci bag with serial number 37-01-5554. You may also check this link for vintage Gucci bags https://bagaholic101.com/ultimate-guide-tell-gucci-bag-real-fake-gucci-accessory-collection-vintage-bags/. Cheers! Hi Crissie! You may post a link to your photos so I can have a look. Upload it on Photobucket or any image hosting site. Cheers! Hi Lhai! You may post a link to your photos so I can have a look. Upload it on Photobucket or any image hosting site. Cheers! Hi Ash! You may post a link to your photos so I can have a look. Upload it on Photobucket or any image hosting site. Cheers! Hi, I have this Vintage Gucci with the serial # 14.02.013, could you tell if this is fake o real? Hi Yadira! Please complete photos of the Gucci bag so it can be authenticated. Cheers! Hi!, can you help me out and tell me if this is fake? Thank you! Hi Lindsay! The links you provided are not working. Hi Grani! Yes, I can help you out with authenticating your vintage Gucci bag. Please upload clear and close-up photos of your Gucci’s serial number and leather tag. Cheers! Hi Grani! I believe that his brown Gucci monogram bucket tote bag with serial number 002.1099 002058 is fake. Hi Amanda! In my opinion, this vintage Gucci bag with serial number 001.58.0920 is authentic. Cheers! Hi, yes, I just saw your comment. Kindly post the photos of the Gucci bag you want to be looked at here in the comments. You may upload the photos on Photobucket, Tinypic or Imgur. Cheers! Hi! It is possible to have authentic vintage Gucci bags with this number. But please post photos of the bag in question to have a closer look. Cheers! Hi! I love your site. It’s auper insightful! But because I’m such a newbie can I get your help determine if this vintage I bought is real or fake? Can’t wait to hear from you soon and thank you! Hi Jess! This round vintage Gucci monogram bag with serial number “007.115.0088” is authentic. Hi! This Gucci bag with serial number “0056799 0058” is fake. Hi! This Gucci bag with diamante lining is authentic. It uses a smooshy, soft leather, thus the embossing looks peculiar. Cheers! Hi what is the email for you so I may send you photos/information on some bags I’d like your expertise in? Hi Francesca! Please upload a photo on Tinypic or Imgur, and paste the links here. Cheers! Hi Angela! This is an authentic vintage Gucci monogram bucket bag. However, please note that the lining of these bags tends to be flaky overtime, reduced to a flaky quality. Cheers! This was a gift back in high school 80s, and always wondered if real. Moms boyfriend who was a “look at me” man. Can you help? If it is real…whats the value? Hi Cathryn! Please upload a photo on Tinypic or Imgur, and paste the links here. Cheers! Hello, I just bought a GUCCI bag at GUCCI outlet in florida. Are those authentic too? Thanks! Hi! Gucci Outlet bags should be authentic. But for your peace of mind, post a picture here as uploaded through TInypic or Imgur. Cheers! Hi Camille! I will be needing photos of the bag. Please upload on Imgur or Tinypic, and put the link in your comment. Cheers! Hi Clare! I will be needing clear photos of the Gucci bag, especially the Gucci tag and serial number. Please upload on Imgur or Tinypic, and put the links in your comment. Cheers! Hi Clare! I need photos of the Gucci tag and the serial number. Cheers! hi Clare! This vintage Gucci bag with serial number “37-01-5572” is authentic. Cheers! Hi there. I have my eye on this vintage bag, can you tell me if it is authentic? Hi Cassi! This vintage Gucci monogram canvas sling bag with serial number “007.23.0017” is authentic. Cheers! I just purchaseda Soho Bag on Mercari. Hi Gabriela! The item has been deleted already. Hi Jessica! This vintage monogram Gucci Accessory Collection bag with serial number “89.02.018” is authentic… AND STUNNING! Can you please help authenticate? Hi Jamie! For this free Gucci bag authentication, I will be needing clear photos of the Gucci bag, especially Gucci marking inside the bag. Although this has no serial number, it should have these markings. Please upload on Imgur or Tinypic, and put the links in your comment. Cheers! i would be really grateful if you could authenticate this bag for me, Thanks! Hi Georgia! This black monogram canvas Gucci shoulder bag with serial number “90646 1705” is authentic. Cheers! Hi Is this accessory bag authentic? Hi Fritzie! The Imgur link does not work. Please provide the correct link. Cheers! Just bought this bag, please help to tell if its fake? Hi, I saw a Gucci bag on Shpock that I like but I’m not sure if it’s real. The price is quite cheap for its actual price in the shops and the person is selling so many Gucci things. Would you be able to tell? Hi Noor! For this free Gucci bag authentication, I will be needing clear photos of the Gucci bag, especially the Gucci marking inside the bag. Please upload on Imgur or Tinypic, and put the links in your comment. Cheers! Hi Devorah! For this free Gucci bag authentication, I will be needing clear photos of the Gucci bag, especially the Gucci marking inside the bag. Please upload on Imgur or Tinypic, and put the links in your comment. Cheers! Can you please tell me if this is authentic!! Thank you! Hi Marissa! The Gucci bag, unfortunately, is no longer available. Hello! Could you authenticate this bag for me? I’m concerned about the periods in the serial number, rather than the bullets and hyphens I’ve seen on all the photos on your site and others. Thank you!!! Hi D! This vintage Gucci Accessory Collection bag with serial number “116.02.007” is authentic. Cheers! Hi Richard! For this free Gucci bag authentication, I will be needing clear photos of the Gucci bag, especially the Gucci marking inside the bag. Please upload on Imgur or Tinypic, and put the links in your comment. Cheers! Hi Richard! The link you provided from Avito is not working. For this free Gucci bag authentication, I will be needing clear photos of the Gucci bag, especially the Gucci marking inside the bag. Please upload on Imgur or Tinypic, and put the links in your comment. Cheers! Hi there! Could you help verify the authenticity? Much appreciated. Hi Jasmine! This Gucci Diana bag with bamboo handles and serial number “002.1186.0259” is authentic! And not to mention, EXQUISITE! The leather is made from pigskin: https://bagaholic101.com/leather-talk/ . Cheers! You’re very much welcome, Michelle! Hi Eric! This white vintage Gucci monogram sling bag with serial number “001.261.4425” is authentic! Cheers! Hi Xana! This black Gucci Mamront Flap bag with gold hardware and serial number “446744 9022” is unfortunately fake. And quite a bad fake if I may add. Did you buy this from Japan yourself, or a seller claiming it was bought from Japan? Yes, Japan has strict laws on selling counterfeit items. This is the reason why a lot of people selling online will claim that their items came from Japan to lend an air of authenticity to it. Hope you get a refund. Cheers! Please how do i know if the gucci bag i bought for my wife on Ebay is Authentic. Hi John! This Gucci Nymphaea Bamboo Top Handle bag with serial number “459076 520981” is authentic! Cheers! Hi Kanesha! For this free Gucci bag authentication, I will be needing clear photos of the Gucci bag, especially the Gucci marking inside the bag. Please upload on Imgur or Tinypic, and put the links in your comment. Cheers! I found a Gucci bag in my house but there is no serial number on the back of the tag. I looked all over the purse and there is no serial number anywhere. This purse has all of the characteristics of an authentic bag except there is no serial number. Can you please verify? Hi Scott! For this free Gucci bag authentication, I will be needing clear photos of the Gucci bag, especially the Gucci marking inside the bag. Please upload on Imgur or Tinypic, and put the links in your comment. Cheers! I’m thinking of buy this Gucci crossbody bag on mercato, can you please check to see if this is authentic? Thank you so much in advance! Hi Tina! This black Gucci Marmont Bag with serial number “448065 170701” is authentic! Cheers! Hi Rims! For this free Gucci bag authentication, I will be needing clear photos of the Gucci bag, especially the Gucci marking inside the bag. Please upload on Imgur or Tinypic, and put the links in your comment. Hi I’m not sure if my first post went thru so I’m posting again… can you let me know if this bag is authentic? Thank you so much! Hi Tina! This black leather vintage Gucci bag with serial number “001.406.0625” is authentic. Cheers! Hi Julie! 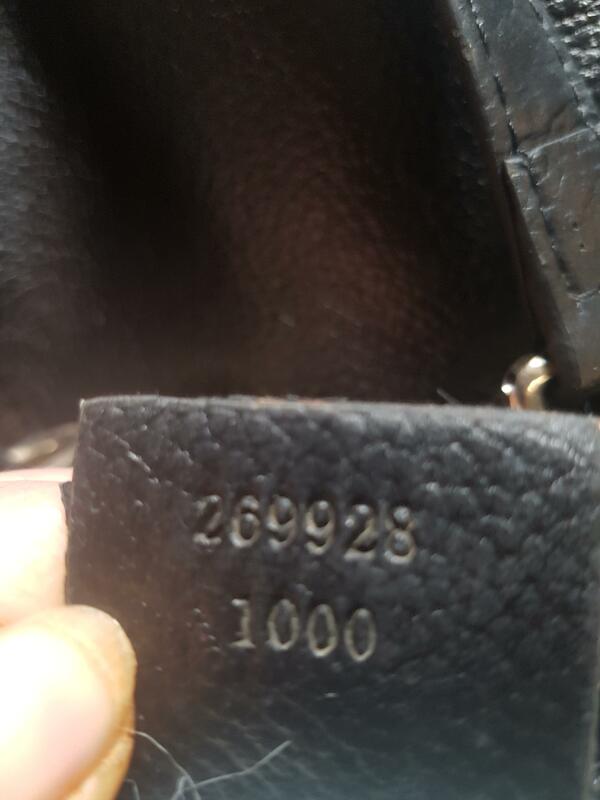 This black Gucci leather bag with gold hardware and serial number “269928 1000” is fake. Hi John Smith! Yes, this vintage Gucci bag with serial number “012.024.0525.50” will not have the registered trademark. A gorgeous vintage luggage bag! Hi Suzanne! The photos are not working. Hi Suzanne1 This vintage monogram Gucci Accessory Collection wallet with serial number “72.03.115” is authentic. Cheers! Please help with authentication of this bag, thank you! Hi Jason! The tag looks like it was cut from an authentic vintage bag and glued onto this bag’s interior. I’d stay away, if I were you. I just bought a Gucci bag And I cannot tell if it is authentic!! The serial number is 001•4206 and then the second line is 001998. I’d be happy to send some pictures! Hi Alexis! You may try BAGAHOLIC 101’s Gucci bag authentication service for only a minimal fee of US$ 5. More information here: https://bagaholic101.com/gucci-authentication-service-by-bagaholic-101/ . Cheers! Hi Abby! You may try BAGAHOLIC 101’s Gucci bag authentication service for only a minimal fee of US$ 5. More information here: https://bagaholic101.com/gucci-authentication-service-by-bagaholic-101/ . Cheers! Hi Mellisa! Please upload a clear and close-up photos of the Gucci bag on Tinypic or Imgur, and paste the links here. Cheers! Can you please help me authorized this bag. Thank you! Hi Celeste! You may try BAGAHOLIC 101’s authentication service for only a minimal fee of US$ 5. More information here: https://bagaholic101.com/gucci-authentication-service-by-bagaholic-101/ . Cheers! I found some vintage bags that have totally different kind of font. Are they good or red flag? BTW, your quick is wonderful.ni learned a lot from you. You must spend a lot of time on it. Really appreciate it. Have a great day. Hi Elise! Yes, I spent weeks curating the content. Glad this was helpful. On the other hand, you may try BAGAHOLIC 101’s Gucci bag authentication service for only a minimal fee of US$ 5. More information here: https://bagaholic101.com/gucci-authentication-service-by-bagaholic-101/ . Cheers!